But karma doesn’t really go with Catholicism, does it? *wicked grin* That’s the extent of my Catholic school experience–i.e., none! Congratulations Alice!! Liz hope you have your “real” moment” soon – we all can’t wait to get our hands on your new book!! The extent of my Catholic school experience was rummaging through the desks of the students who went to the Catholic school during CCD on Saturday mornings. It wasn’t me — I watched other kids doing it. But did you know your stuff had been touched? And my parents told me stories about their Catholic school experiences. My mother said they didn’t tell you whether you had passed onto the next grade until September — you had to sweat it out all summer. And my father said they boxed your ears and rapped your knuckles w/a ruler if you were not obedient. I LOVE plaid and I’m very obedient so I think I really missed something there! Alice, you know I loved your book but I would love a physical copy of it, too, so pick meeeee. 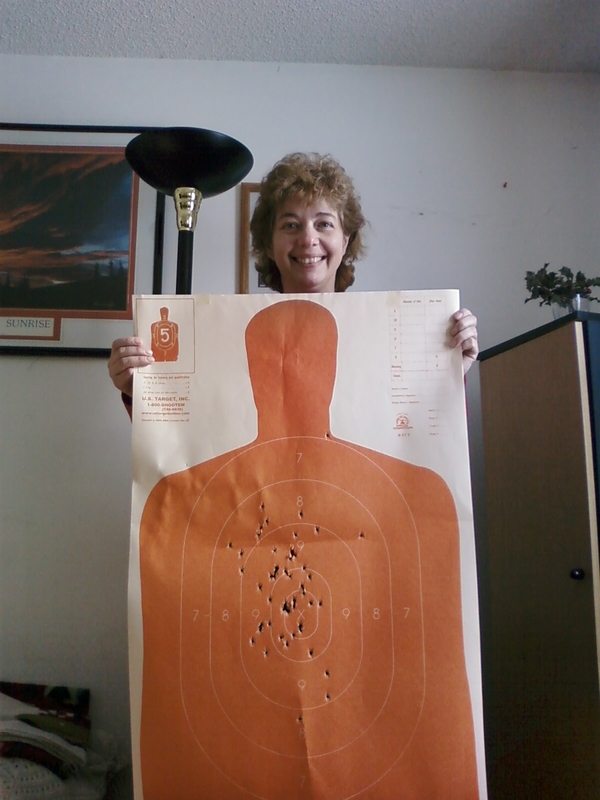 Love the photo of you with the perforated target, Alice. And Liz, here’s to your own “real” moment, whenever it comes! I have no Catholic school experience to share! I hardly have any inside church experiences to share! When I was in Kindergarten and first grade or thereabouts, I had friends who wanted to take me to their churches. I found church very confusing. When they talked about “the Father, The Son and the Holy Ghost,” all I could picture was someone running around in a sheet with holes in it. I’m very much looking forward to reading both of your books! Congrats on the great interview and review!!! No surprise that she loved it. I’ve already pre-ordered my book on Amazon and can’t wait to get it.